In University of Cambridge psychologist Rosalind Ridley’s 2016 book Peter Pan and the Mind of J.M. Barrie: An Exploration of Cognition and Consciousness (Cambridge Scholars Publishing), we learn that there is more to the story than pirates and children who can fly. 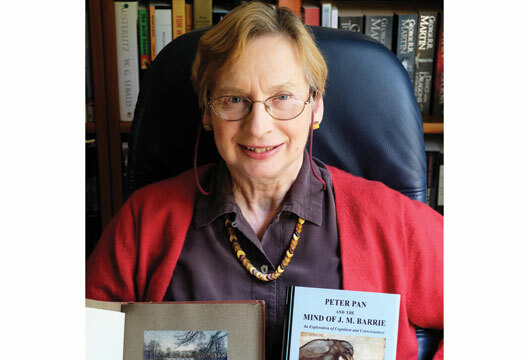 Barrie was very aware of the scientific developments of his day, and the original Peter Pan stories are infused with ideas about humanity’s place in the natural world and the mental lives of children and animals. In many places Barrie seems to have anticipated ideas in psychology that only emerged after his death. Here, UCL psychologist Chris Frith asks his friend and erstwhile colleague why Barrie’s ideas are important for contemporary psychology. How did a respected neuroscientist come to write a book about Peter Pan? I came across an early edition of Barrie’s first Peter Pan book, 1906’s Peter Pan in Kensington Gardens, by accident. In the text I found descriptions of many aspects of cognitive psychology that have only been studied scientifically since the middle of the 20th century… I think of Ulric Neisser’s 1967 Cognitive Psychology. The more I read, the more I found. I was hooked. Most people are unaware that Barrie wrote two novels about Peter Pan in addition to the pantomime. Do these give us a different view of the nature of Peter Pan and the intentions of Barrie? In Peter Pan in Kensington Gardens Peter is about a week old while in 1911’s Peter and Wendy, which is based on the pantomime, he is about six or seven years old (although he supposedly still has his baby teeth, which indicates his immaturity). Although Peter is ‘the boy who wouldn’t grow up’ he undergoes several changes of age, out of synchrony with other people in the stories. One explanation for this is that Peter is Barrie’s memory of himself as a child achieved through ‘mental time travel’, and that Barrie is both exploring the nature of childhood and re-living his own childhood. Barrie was a lonely man who had had a difficult childhood and a childless marriage that ended in divorce. He found adults difficult and sought refuge in a fantasy world, outside the normal stream of consciousness of our mundane existence. And yet, he was also one of the most successful authors of his time and knew everyone from Thomas Hardy to A.A. Milne. But Barrie certainly had problems. I believe that, like Lewis Carroll, he suffered from insomnia but that he attempted to control this by taking heroin. He must often have experienced the strange states of consciousness that occur at the borders of sleeping and waking. Did these experiences inspire aspects of the Pan story? Yes, Barrie complained of terrible sleep and gave accurate descriptions of almost all the clinical parasomnias in his stories. It is more than likely that he experienced these sleep disturbances and that this taught him that what he experienced and what was happening ‘out there’ are not the same thing. When Barrie was six years old his older brother drowned. Their mother became very depressed and Barrie felt that his dead brother was more real in his mother’s mind than he was. This may have encouraged Barrie to think in terms of internal mental states rather than the outside world. Barrie seems to have been seeking a special state of heightened consciousness, which he believed people experienced in some historical or childish Golden Age. You call this state ‘sublime consciousness’. What is this? Although he didn’t use these terms, Barrie clearly understood Josef Perner’s modern distinction between primary mental representation (mainly perception) and secondary representation (mainly episodic memory, anticipation of future, and the imagination of alternatives). His stories were based on the notion that these were different, mutually exclusive, types of consciousness and that only adult humans had what we would now call ‘secondary representation’. He longed for pure primary consciousness (which I have called sublime consciousness), which he believed was available to animals, children and only occasionally to adults. Barrie argued that animals and very young children were not burdened with the ‘sense of time’ or ‘sense of agency’ that comes with the development of secondary representations and so were free to enjoy a heightened experience of the present. This reminds me of that research by Jonathan Schooler, Dan Ariely and George Lowenstein, showing that, if you think about being happy, you will feel less happy. But isn’t there one animal in the stories who does have secondary representation? Yes, Solomon the crow. In the picture by Arthur Rackham we see him with the sock he is using to save for his pension. Crows have always had a reputation for being clever and my colleague, Nicky Clayton, has published work suggesting that they can plan for the future. And research led by Seweryn Olkowicz in Prague finds that crows’ brains contain more neurons than the brains of some primates of comparable size. I remember the rather sentimental episode in the pantomime where children are told that every time they say, ‘I don’t believe in fairies’, then a fairy will die. But, in your book, you suggest that Barrie is making a comparison between the type of thing that fairies are and the type of thing that money is. Well, yes, Barrie liked to play tricks with words and ideas. He made ethereal objects behave like solid objects; a shadow, for example, is folded up and put in a drawer. Like Lewis Carroll, Barrie saw that words and the objects they represented were separable but, whereas Carroll (in Through the Looking Glass…) adopted a semantic view that ‘a word… means just what I choose it to mean’, Barrie took a more pragmatic approach in making Wendy describe a ‘kiss’ as a ‘thimble’ when she could see that Peter was using the two words the wrong way round. Barrie then goes on to distinguish between solid objects and socially constructed objects, just as John Searle did in 1995’s The Construction of Social Reality. In a rather complex scene, Peter has forgotten how to fly and is marooned on the island in the Long Water in Kensington Gardens. A boat made out of a five pound note washes up on the island, but, rather than using the boat to make his escape, Peter cuts the bank note up into smaller pieces and uses these to pay the thrushes (who have been told that these ‘coins’ are valuable) to build him a bird’s nest boat. Here Barrie recognised that money is not only a piece of paper, but is also a socially constructed object that only exists as currency so long as everyone believes in it. Similarly, fairies are socially constructed objects, who only exist if you and your friends believe in them. We once did an imaging study, led by Cristina Becchio, where people watched bank notes being torn up. The higher the value, the more brain activity we saw. You suggest that a major theme of the Peter Pan stories concerns the cognitive differences between animals, children and adults. After Darwin published his theory of evolution, people had to reconsider these differences, since he had shown that we are all animals. Peter Pan is described as a ‘betwixt-and-between’, part child, part bird (he can fly) and part instinctive, slightly dangerous creature, like the god Pan. This allowed Barrie to compare the mental world of adults, children and animals and to consider the extent to which human behaviour is instinctive rather than rational and enculturated. These are very post-Darwinian themes, and Barrie clearly believed that children start life with animal instincts and develop additional, specifically human cognitive skills as they mature. This reflects the view put forward by the 19th-century embryologist Ernst Haeckel that ‘ontogeny recapitulates phylogeny’. It would not have occurred to anyone before Darwin to compare the behaviour, especially the moral behaviour, of humans and animals… the view was that humans were made in the image of God and animals were just dumb beasts. Barrie also refers to paths in Kensington Gardens that have been made by men and adjacent ‘vagrant paths that have made themselves’, suggesting that he understood that evolution could apply to anything that was based on bottom-up processes, not just plants and animals. One of the more exciting research programmes to emerge toward the end of the 20th century was about theory of mind or mentalising, for example Premack and Woodruff’s work. This is the ability that enables us to realise that other people may have different beliefs from us and that it is these beliefs, rather than reality that will determine their behaviour. Children don’t seem to acquire a full version of this ability until they are about six or seven years old. Although Barrie does not specifically discuss the nature of Peter’s cognitive limitations, his various descriptions of Peter’s behaviour certainly indicate failures of mentalising. Peter cannot remember events of the past and cannot understand what ‘afraid’ means because it is about the future. Peter also appears not to have a fully developed theory of mind and the social cognition that develops from it. He has great difficulty dealing with the beliefs and desires of others. “No, indeed it is not,” Wendy replied with frightful emphasis. Here Peter is clearly described as not knowing what it is that Tiger Lily wants to be to him, rather than not knowing how he should respond to her amorous advances. Later Peter gives a puzzled, nervous laugh and skips off merrily when he thinks that Wendy has been shot dead. Well, it’s certainly amazing that Barrie was so much ahead of his time in presenting these various ideas, which we associate with contemporary cognitive psychology, but is this enough? What does your foray into the humanities contribute to contemporary neuropsychology? Barrie was a close observer of human and animal behaviour as well as being extremely well read. I suspect that many of his astute observations were entirely his own but the implications of scientific discovery was a very pressing issue amongst the intelligentsia of the time and Barrie knew a great deal about science. For example, his story of the fairy duke who does not know that he is in love charmingly demonstrates the James/Lange theory of emotion, which was proposed at the end of the 19th century. At first I was surprised by the cognitive approach he adopted but I now realise that much early psychology, especially that proposed by William James (whom Barrie had met), was very cognitive in approach. But it was then overshadowed by the subsequent schools of Psychoanalysis and Behaviourism. We should pay much more attention to the psychological insights of the 19th and early 20th century. Barrie’s literature makes science accessible, but Barrie also showed that a good grounding in science and the scientific approach can contribute to literature when he said in his 1922 Rectorial Address at St Andrew’s University ‘science is the surest means of teaching you how to know what you mean’. - Our coverage of books is changing. We’ll be having more in-depth interviews, articles based on books and exclusive online extracts. There will still be a place for reviews, alongside several new regular features: we expect these to return next month. If you are a book publisher who has yet to get involved in our discussions over the new approach, get in touch with the editor on [email protected].